These highlights do not include all the information needed to use ZOLINZA safely and effectively. See full prescribing information for ZOLINZA. To report SUSPECTED ADVERSE REACTIONS, contact Merck Sharp & Dohme Corp., a subsidiary of Merck & Co., Inc., at 1-877-888-4231 or FDA at 1-800-FDA-1088 or www.fda.gov/medwatch. ZOLINZA® is indicated for the treatment of cutaneous manifestations in patients with cutaneous T-cell lymphoma who have progressive, persistent or recurrent disease on or following two systemic therapies. The recommended dose is 400 mg orally once daily with food. Treatment may be continued as long as there is no evidence of progressive disease or unacceptable toxicity. ZOLINZA capsules should not be opened or crushed [see How Supplied/Storage and Handling (16)]. If a patient is intolerant to therapy, the dose may be reduced to 300 mg orally once daily with food. The dose may be further reduced to 300 mg once daily with food for 5 consecutive days each week, as necessary. Reduce the starting dose to 300 mg orally once daily with food in patients with mild to moderate hepatic impairment (bilirubin 1 to 3 × ULN or AST greater than ULN). There is insufficient evidence to recommend a starting dose for patients with severe hepatic impairment (bilirubin greater than 3 × ULN) [see Use in Specific Populations (8.6) and Clinical Pharmacology (12.3)]. Capsules: 100 mg white, opaque, hard gelatin capsules with "568" over "100 mg" printed within radial bar in black ink on the capsule body. Pulmonary embolism occurred in 5% (4/86) of patients receiving ZOLINZA, and deep vein thrombosis has also been reported. Monitor for signs and symptoms of these events, particularly in patients with a prior history of thromboembolic events [see Adverse Reactions (6)]. Treatment with ZOLINZA can cause dose-related thrombocytopenia and anemia. Monitor blood counts every 2 weeks during the first 2 months of therapy and monthly thereafter. Adjust dosage or discontinue treatment with ZOLINZA as clinically appropriate [see Dosage and Administration (2.2), Warnings and Precautions (5.6) and Adverse Reactions (6)]. Gastrointestinal disturbances, including nausea, vomiting and diarrhea, have been reported [see Adverse Reactions (6)] and may require the use of antiemetic and antidiarrheal medications. Fluid and electrolytes should be replaced to prevent dehydration [see Adverse Reactions (6.1)]. Pre-existing nausea, vomiting, and diarrhea should be adequately controlled before beginning therapy with ZOLINZA. Hyperglycemia has been observed in patients receiving ZOLINZA and was severe in 5% (4/86) of patients [see Adverse Reactions (6.1)]. Monitor serum glucose every 2 weeks during the first 2 months of therapy and monthly thereafter. Obtain chemistry tests, including serum electrolytes, creatinine, magnesium, and calcium, every 2 weeks during the first 2 months of therapy and monthly thereafter. Correct hypokalemia and hypomagnesemia prior to administration of ZOLINZA. Monitor potassium and magnesium more frequently in symptomatic patients (e.g., patients with nausea, vomiting, diarrhea, fluid imbalance or cardiac symptoms). Severe thrombocytopenia leading to gastrointestinal bleeding has been reported with concomitant use of ZOLINZA and other HDAC inhibitors (e.g., valproic acid). Monitor platelet counts more frequently [see Drug Interactions (7.2)]. Based on findings from animal studies and its mechanism of action, ZOLINZA can cause fetal harm when administered to a pregnant woman. There are insufficient data on ZOLINZA use in pregnant women to inform a drug-associated risk of major birth defects and miscarriage. In animal reproduction studies, vorinostat crossed the placenta and caused adverse developmental outcomes at exposures approximately 0.5 times the human exposure based on AUC0-24 hours. Advise females of reproductive potential to use effective contraception during treatment and for at least 6 months after the last dose. Advise males with female sexual partners of reproductive potential to use effective contraception during treatment and for at least 3 months after the last dose [see Use in Specific Populations (8.1, 8.3) and Clinical Pharmacology (12.1)]. The safety of ZOLINZA was evaluated in 107 CTCL patients in two single arm clinical studies in which 86 patients received 400 mg once daily. The data described below reflect exposure to ZOLINZA 400 mg once daily in the 86 patients for a median number of 97.5 days on therapy (range 2 to 480+ days). Seventeen (19.8%) patients were exposed beyond 24 weeks and 8 (9.3%) patients were exposed beyond 1 year. The population of CTCL patients studied was 37 to 83 years of age, 47.7% female, 52.3% male, and 81.4% white, 16.3% black, and 1.2% Asian or multi-racial. The most common drug-related adverse reactions can be classified into 4 symptom complexes: gastrointestinal symptoms (diarrhea, nausea, anorexia, weight decrease, vomiting, constipation), constitutional symptoms (fatigue, chills), hematologic abnormalities (thrombocytopenia, anemia), and taste disorders (dysgeusia, dry mouth). The most common serious drug-related adverse reactions were pulmonary embolism and anemia. Table 1 summarizes the frequency of CTCL patients with specific adverse reactions, using the National Cancer Institute-Common Terminology Criteria for Adverse Events (NCI-CTCAE, version 3.0). The frequencies of more severe thrombocytopenia, anemia [see Warnings and Precautions (5.2)] and fatigue were increased at doses higher than 400 mg once daily of ZOLINZA. The most common serious adverse reactions in the 86 CTCL patients in two clinical trials were pulmonary embolism reported in 4.7% (4/86) of patients, squamous cell carcinoma reported in 3.5% (3/86) of patients and anemia reported in 2.3% (2/86) of patients. There were single events of cholecystitis, death (of unknown cause), deep vein thrombosis, enterococcal infection, exfoliative dermatitis, gastrointestinal hemorrhage, infection, lobar pneumonia, myocardial infarction, ischemic stroke, pelviureteric obstruction, sepsis, spinal cord injury, streptococcal bacteremia, syncope, T-cell lymphoma, thrombocytopenia and ureteric obstruction. Of the CTCL patients who received the 400-mg once daily dose, 9.3% (8/86) of patients discontinued ZOLINZA due to adverse reactions. These adverse reactions, regardless of causality, included anemia, angioneurotic edema, asthenia, chest pain, exfoliative dermatitis, death, deep vein thrombosis, ischemic stroke, lethargy, pulmonary embolism, and spinal cord injury. Of the CTCL patients who received the 400-mg once daily dose, 10.5% (9/86) of patients required a dose modification of ZOLINZA due to adverse reactions. These adverse reactions included increased serum creatinine, decreased appetite, hypokalemia, leukopenia, nausea, neutropenia, thrombocytopenia and vomiting. The median time to the first adverse reactions resulting in dose reduction was 42 days (range 17 to 263 days). Laboratory abnormalities were reported in all of the 86 CTCL patients who received the 400-mg once-daily dose. Increased serum glucose was reported as a laboratory abnormality in 69% (59/86) of CTCL patients who received the 400-mg once daily dose; only 4 of these abnormalities were severe (Grade 3). Increased serum glucose was reported as an adverse reaction in 8.1% (7/86) of CTCL patients who received the 400-mg once daily dose [see Warnings and Precautions (5.4)]. Transient increases in serum creatinine were detected in 46.5% (40/86) of CTCL patients who received the 400-mg once daily dose. Of these laboratory abnormalities, 34 were NCI CTCAE Grade 1, 5 were Grade 2, and 1 was Grade 3. Proteinuria was detected as a laboratory abnormality (51.4%) in 38 of 74 patients tested. The clinical significance of this finding is unknown. Based on reports of dehydration as a serious drug-related adverse reaction in clinical trials, patients were instructed to drink at least 2 L/day of fluids for adequate hydration [see Warnings and Precautions (5.3, 5.5)]. The frequencies of individual adverse reactions were substantially higher in the non-CTCL population. Drug-related serious adverse reactions reported in the non-CTCL population which were not observed in the CTCL population included single events of blurred vision, asthenia, hyponatremia, tumor hemorrhage, Guillain-Barré syndrome, renal failure, urinary retention, cough, hemoptysis, hypertension, and vasculitis. In patients recovering from bowel surgery and treated perioperatively with ZOLINZA, anastomotic healing complications including fistulas, perforations, and abscess formation have occurred. Prolongation of prothrombin time (PT) and International Normalized Ratio (INR) were observed in patients receiving ZOLINZA concomitantly with coumarin-derivative anticoagulants. Physicians should monitor PT and INR more frequently in patients concurrently administered ZOLINZA and coumarin derivatives. Severe thrombocytopenia and gastrointestinal bleeding have been reported with concomitant use of ZOLINZA and other HDAC inhibitors (e.g., valproic acid). Monitor platelet count every 2 weeks for the first 2 months [see Warnings and Precautions (5.6)]. Based on its mechanism of action and findings from animal studies, ZOLINZA can cause fetal harm when administered to a pregnant woman [see Clinical Pharmacology (12.1)]. There are insufficient data on ZOLINZA use in pregnant women to inform a drug-associated risk of major birth defects and miscarriage. In animal reproduction studies, administration of vorinostat to pregnant rats and rabbits during the period of organogenesis caused adverse developmental outcomes at maternal exposures approximately 0.5 times the human exposure based on AUC0-24 hours (see Data). Advise pregnant women of the potential risk to a fetus. Results of animal studies indicate that vorinostat crosses the placenta and is found in fetal plasma at levels up to 50% of maternal concentrations. Doses up to 50 and 150 mg/kg/day were tested in rats and rabbits, respectively (~0.5 times the human exposure based on AUC0-24 hours). Treatment-related developmental effects including decreased mean live fetal weights, incomplete ossifications of the skull, thoracic vertebra, sternebra, and skeletal variations (cervical ribs, supernumerary ribs, vertebral count and sacral arch variations) were seen in rats at the highest dose of vorinostat tested. Reductions in mean live fetal weight and an elevated incidence of incomplete ossification of the metacarpals were seen in rabbits dosed at 150 mg/kg/day. The no observed effect levels (NOELs) for these findings were 15 and 50 mg/kg/day (<0.1 times the human exposure based on AUC) in rats and rabbits, respectively. A dose-related increase in the incidence of malformations of the gall bladder was noted in all drug treatment groups in rabbits versus the concurrent control. There are no data on the presence of ZOLINZA or its metabolites in human milk, the effects on a breastfed child, or the effects on milk production. Because many drugs are excreted in human milk and because of the potential for serious adverse drug reactions in a nursing child, advise lactating women not to breastfeed during treatment with ZOLINZA and for at least 1 week after the last dose. ZOLINZA can cause fetal harm when administered to a pregnant woman [see Warnings and Precautions (5.7) and Use in Specific Populations (8.1)]. Perform pregnancy testing in females of reproductive potential within 7 days prior to initiating therapy with ZOLINZA. Advise females of reproductive potential to use effective contraception during treatment with ZOLINZA and for at least 6 months after the last dose. Advise males with female partners of reproductive potential to use effective contraception and to avoid fathering a child during treatment with ZOLINZA and for at least 3 months after the last dose. Based on findings in animals, vorinostat has the potential to affect female fertility [see Nonclinical Toxicology (13.1)]. The safety and effectiveness of ZOLINZA in pediatric patients have not been established. Clinical studies of ZOLINZA did not include sufficient numbers of subjects aged 65 and over to determine whether they respond differently from younger subjects. Other reported clinical experience has not identified differences in responses between the elderly and younger patients. ZOLINZA was studied in 42 patients with non-CTCL cancer and varying degrees of hepatic impairment after single and multiple-dose administration. Compared to patients with normal liver function, AUC increases of 50 to 66% were observed in patients with hepatic impairment. The incidence of Grade 3 or 4 thrombocytopenia increased in patients with mild (bilirubin of 1 to 1.5 × ULN and AST < ULN, or bilirubin â‰¤ ULN and AST > ULN) and moderate (bilirubin 1.5 to â‰¤ 3 × ULN) hepatic impairment treated daily at doses of 300 and 200 mg respectively. Patients with severe hepatic impairment (bilirubin > 3 × ULN) have not been treated at doses greater than 200 mg a day. Reduce the initial dose of ZOLINZA in patients with bilirubin 1 to 3 × ULN or AST > ULN [see Dosage and Administration (2.2) and Clinical Pharmacology (12.3)]. No specific information is available on the treatment of overdosage of ZOLINZA. In the event of overdose, it is reasonable to employ the usual supportive measures, e.g., remove unabsorbed material from the gastrointestinal tract, employ clinical monitoring, and institute supportive therapy, if required. It is not known if vorinostat is dialyzable. ZOLINZA contains vorinostat, which is described chemically as N-hydroxy-N'-phenyloctanediamide. Vorinostat is a white to light orange powder. It is very slightly soluble in water, slightly soluble in ethanol, isopropanol and acetone, freely soluble in dimethyl sulfoxide and insoluble in methylene chloride. It has no chiral centers and is non-hygroscopic. The differential scanning calorimetry ranged from 161.7 (endotherm) to 163.9°C. The pH of saturated water solutions of vorinostat drug substance was 6.6. The pKa of vorinostat was determined to be 9.2. Each 100 mg ZOLINZA capsule for oral administration contains 100 mg vorinostat and the following inactive ingredients: microcrystalline cellulose, sodium croscarmellose and magnesium stearate. The capsule shell excipients are titanium dioxide, gelatin and sodium lauryl sulfate. Vorinostat inhibits the enzymatic activity of histone deacetylases HDAC1, HDAC2 and HDAC3 (Class I) and HDAC6 (Class II) at nanomolar concentrations (IC50<86 nM). These enzymes catalyze the removal of acetyl groups from the lysine residues of proteins, including histones and transcription factors. In some cancer cells, there is an overexpression of HDACs, or an aberrant recruitment of HDACs to oncogenic transcription factors causing hypoacetylation of core nucleosomal histones. Hypoacetylation of histones is associated with a condensed chromatin structure and repression of gene transcription. Inhibition of HDAC activity allows for the accumulation of acetyl groups on the histone lysine residues resulting in an open chromatin structure and transcriptional activation. In vitro, vorinostat causes the accumulation of acetylated histones and induces cell cycle arrest and/or apoptosis of some transformed cells. The mechanism of the antineoplastic effect of vorinostat has not been fully characterized. A randomized, partially-blind, placebo-controlled, 2-period crossover study was performed to assess the effects of a single 800-mg dose of vorinostat on the QTc interval in 24 patients with advanced cancer. This study was conducted to assess the impact of vorinostat on ventricular repolarization. The upper bound of the 90% confidence interval of the placebo-adjusted mean QTc interval change-from-baseline was less than 10 msec at every time point through 24 hours. Based on these study results, administration of a single supratherapeutic 800-mg dose of vorinostat does not appear to prolong the QTc interval in patients with advanced cancer; however the study did not include a positive control to demonstrate assay sensitivity. In the fasted state, oral administration of a single 800-mg dose of vorinostat resulted in a mean AUC and Cmax and median Tmax of 8.6±5.7 µMâˆ™hr and 1.7±0.67 µM and 2.1 (0.5-6) hours, respectively. In clinical studies in patients with CTCL, three of 86 CTCL patients exposed to 400 mg once daily had Grade 1 (>450-470 msec) or 2 (>470-500 msec or increase of >60 msec above baseline) clinical adverse reactions of QTc prolongation. In a retrospective analysis of three Phase 1 and two Phase 2 studies, 116 patients had a baseline and at least one follow-up ECG. Four patients had Grade 2 (>470-500 msec or increase of >60 msec above baseline) and 1 patient had Grade 3 (>500 msec) QTc prolongation. In 49 non-CTCL patients from 3 clinical trials who had complete evaluation of QT interval, 2 had QTc measurements of >500 msec and 1 had a QTc prolongation of >60 msec. The pharmacokinetics of vorinostat were evaluated in 23 patients with relapsed or refractory advanced cancer. After oral administration of a single 400-mg dose of vorinostat with a high-fat meal, the mean ± standard deviation area under the curve (AUC) and peak serum concentration (Cmax) and the median (range) time to maximum concentration (Tmax) were 5.5±1.8 µMâˆ™hr, 1.2±0.62 µM and 4 (2-10) hours, respectively. In the fasted state, oral administration of a single 400-mg dose of vorinostat resulted in a mean AUC and Cmax and median Tmax of 4.2±1.9 µMâˆ™hr and 1.2±0.35 µM and 1.5 (0.5-10) hours, respectively. Therefore, oral administration of vorinostat with a high-fat meal resulted in an increase (33%) in the extent of absorption and a modest decrease in the rate of absorption (Tmax delayed 2.5 hours) compared to the fasted state. However, these small effects are not expected to be clinically meaningful. In clinical trials of patients with CTCL, vorinostat was taken with food. At steady state in the fed-state, oral administration of multiple 400-mg doses of vorinostat resulted in a mean AUC and Cmax and a median Tmax of 6.0±2.0 µMâˆ™hr, 1.2±0.53 µM and 4 (0.5-14) hours, respectively. Vorinostat is approximately 71% bound to human plasma proteins over the range of concentrations of 0.5 to 50 µg/mL. The major pathways of vorinostat metabolism involve glucuronidation and hydrolysis followed by Î²-oxidation. Human serum levels of two metabolites, O-glucuronide of vorinostat and 4-anilino-4-oxobutanoic acid were measured. Both metabolites are pharmacologically inactive. Compared to vorinostat, the mean steady state serum exposures in humans of the O-glucuronide of vorinostat and 4-anilino-4-oxobutanoic acid were 4-fold and 13-fold higher, respectively. In vitro studies using human liver microsomes indicate negligible biotransformation by cytochromes P450 (CYP). Vorinostat is eliminated predominantly through metabolism with less than 1% of the dose recovered as unchanged drug in urine, indicating that renal excretion does not play a role in the elimination of vorinostat. The mean urinary recovery of two pharmacologically inactive metabolites at steady state was 16±5.8% of vorinostat dose as the O-glucuronide of vorinostat, and 36±8.6% of vorinostat dose as 4-anilino-4-oxobutanoic acid. Total urinary recovery of vorinostat and these two metabolites averaged 52±13.3% of vorinostat dose. The mean terminal half-life (t½) was ~2.0 hours for both vorinostat and the O-glucuronide metabolite, while that of the 4-anilino-4-oxobutanoic acid metabolite was 11 hours. Based upon an exploratory analysis of limited data, gender, race and age do not appear to have meaningful effects on the pharmacokinetics of vorinostat. Vorinostat was not evaluated in patients <18 years of age. The single dose pharmacokinetics of a 400 mg ZOLINZA dose was evaluated in patients with non-CTCL cancers with varying degrees of hepatic impairment. The mean AUC of vorinostat in patients with mild (bilirubin > 1 to 1.5 × ULN or AST > ULN but bilirubin â‰¤ ULN) and moderate (bilirubin 1.5 to â‰¤ 3 × ULN) hepatic impairment increased by 50% compared to the AUC of vorinostat in patients with normal hepatic function. The mean vorinostat AUC in patients with severe hepatic impairment (bilirubin > 3 × ULN) increased by 66% compared to the AUC of patients with normal hepatic function. The safety of multiple daily doses of ZOLINZA was also evaluated in patients with non-CTCL cancers with varying degrees of hepatic impairment. The highest dose studied in mild, moderate and severe hepatic impairment was 400, 300 and 200 mg daily respectively. The incidence of Grade 3 or 4 adverse reactions was similar among the hepatic function groups. The most common Grade 3 or 4 adverse reaction was thrombocytopenia. Reduce the dose in patients with mild to moderate hepatic impairment. There is not enough data in patients with severe hepatic impairment to recommend a dose modification [see Dosage and Administration (2.2) and Use in Specific Populations (8.6)]. Vorinostat was not evaluated in patients with renal impairment. However, renal excretion does not play a role in the elimination of vorinostat. Vorinostat is not an inhibitor of CYP drug metabolizing enzymes in human liver microsomes at steady state Cmax of the 400 mg dose (Cmax of 1.2 µM vs IC50 of >75 µM). Gene expression studies in human hepatocytes detected some potential for suppression of CYP2C9 and CYP3A4 activities by vorinostat at concentrations higher (â‰¥10 µM) than pharmacologically relevant. Thus, vorinostat is not expected to affect the pharmacokinetics of other agents. As vorinostat is not eliminated via the CYP pathways, it is anticipated that vorinostat will not be subject to drug-drug interactions when co-administered with drugs that are known CYP inhibitors or inducers. However, no formal clinical studies have been conducted to evaluate drug interactions with vorinostat. In vitro studies indicate that vorinostat is not a substrate of human P-glycoprotein (P-gp). In addition, vorinostat has no inhibitory effect on human P-gp-mediated transport of vinblastine (a marker P-gp substrate) at concentrations of up to 100 µM. Thus, vorinostat is not likely to inhibit P-gp at the pharmacologically relevant serum concentration of 2 µM (Cmax) in humans. Carcinogenicity studies have not been performed with vorinostat. Vorinostat was mutagenic in vitro in the bacterial reverse mutation assays (Ames test), caused chromosomal aberrations in vitro in Chinese hamster ovary (CHO) cells and increased the incidence of micro-nucleated erythrocytes when administered to mice (Mouse Micronucleus Assay). Treatment-related effects on female reproduction were identified in the oral fertility study when females were dosed for 14 days prior to mating through gestational day 7. Doses of 15, 50 and 150 mg/kg/day to rats resulted in approximate exposures of 0.15, 0.36 and 0.70 times the expected clinical exposure based on AUC. Dose-dependent increases in corpora lutea were noted at â‰¥15 mg/kg/day, which resulted in increased peri-implantation losses at â‰¥50 mg/kg/day. At 150 mg/kg/day, there were increases in the incidences of dead fetuses and in resorptions. No effects on reproductive performance or fertility were observed in male rats dosed (20, 50, 150 mg/kg/day; approximate exposures of 0.15, 0.36 and 0.70 times the expected clinical exposure based on AUC) for 70 days prior to mating with untreated females. In two open-label clinical studies, patients with refractory CTCL have been evaluated to determine their response rate to oral ZOLINZA. One study was a single-arm clinical study and the other assessed several dosing regimens. In both studies, patients were treated until disease progression or intolerable toxicity. In an open-label, single-arm, multicenter non-randomized study (NCT00091559), 74 patients with advanced CTCL were treated with ZOLINZA at a dose of 400 mg once daily. The primary endpoint was response rate to oral ZOLINZA in the treatment of skin disease in patients with advanced CTCL (Stage IIB and higher) who had progressive, persistent, or recurrent disease on or following two systemic therapies. Enrolled patients should have received, been intolerant to or not a candidate for bexarotene. Extent of skin disease was quantitatively assessed by investigators using a modified Severity Weighted Assessment Tool (SWAT). The investigator measured the percentage total body surface area (%TBSA) involvement separately for patches, plaques, and tumors within 12 body regions using the patient's palm as a "ruler". The total %TBSA for each lesion type was multiplied by a severity weighting factor (1=patch, 2=plaque and 4=tumor) and summed to derive the SWAT score. Efficacy was measured as either a Complete Clinical Response (CCR) defined as no evidence of disease, or Partial Response (PR) defined as a â‰¥50% decrease in SWAT skin assessment score compared to baseline. Both CCR and PR had to be maintained for at least 4 weeks. Secondary efficacy endpoints included response duration, time to progression, and time to objective response. The population had been exposed to a median of three prior therapies (range 1 to 12). Table 2 summarizes the demographic and disease characteristics of the Study 1 population. The overall objective response rate was 29.7% (22/74, 95% CI [19.7 to 41.5%]) in all patients treated with ZOLINZA. In patients with Stage IIB and higher CTCL, the overall objective response rate was 29.5% (18/61). One patient with Stage IIB CTCL achieved a CCR. Median times to response were 55 and 56 days (range 28 to 171 days), respectively in the overall population and in patients with Stage IIB and higher CTCL. However, in rare cases it took up to 6 months for patients to achieve an objective response to ZOLINZA. The median response duration was not reached since the majority of responses continued at the time of analysis, but was estimated to exceed 6 months for both the overall population and in patients with Stage IIB and higher CTCL. When end of response was defined as a 50% increase in SWAT score from the nadir, the estimated median response duration was 168 days and the median time to tumor progression was 202 days. Using a 25% increase in SWAT score from the nadir as criterion for tumor progression, the estimated median time-to-progression was 148 days for the overall population and 169 days in the 61 patients with Stage IIB and higher CTCL. Response to any previous systemic therapy does not appear to be predictive of response to ZOLINZA. In an open-label, non-randomized study, ZOLINZA was evaluated to determine the response rate for patients with CTCL who were refractory or intolerant to at least one treatment. In this study, 33 patients were assigned to one of 3 cohorts: Cohort 1, 400 mg once daily; Cohort 2, 300 mg twice daily 3 days/week; or Cohort 3, 300 mg twice daily for 14 days followed by a 7-day rest (induction). In Cohort 3, if at least a partial response was not observed then patients were dosed with a maintenance regimen of 200 mg twice daily. The primary efficacy endpoint, objective response, was measured by the 7-point Physician's Global Assessment (PGA) scale. The investigator assessed improvement or worsening in overall disease compared to baseline based on overall clinical impression. Index and non-index cutaneous lesions as well as cutaneous tumors, lymph nodes and all other disease manifestations were also assessed and included in the overall clinical impression. CCR required 100% clearing of all findings, and PR required at least 50% improvement in disease findings. The median age was 67.0 years (range 26.0 to 82.0). Fifty-five percent of patients were male, and 45% of patients were female. Fifteen percent of patients had Stage IA, IB, or IIA CTCL and 85% of patients had Stage IIB, III, IVA, or IVB CTCL. The median number of prior systemic therapies was 4 (range 0.0 to 11.0). In all patients treated, the objective response was 24.2% (8/33) in the overall population, 25% (7/28) in patients with Stage IIB or higher disease and 36.4% (4/11) in patients with Sezary syndrome. The overall response rates were 30.8%, 9.1% and 33.3% in Cohort 1, Cohort 2 and Cohort 3, respectively. The 300 mg twice daily regimen had higher toxicity with no additional clinical benefit over the 400 mg once daily regimen. No CCR was observed. Among the 8 patients who responded to study treatment, the median time to response was 83.5 days (range 25 to 153 days). The median response duration was 106 days (range 66 to 136 days). Median time to progression was 211.5 days (range 94 to 255 days). Store at 20-25°C (68-77°F), excursions permitted between 15-30°C (59-86°F) [see USP Controlled Room Temperature]. Procedures for proper handling and disposal of anticancer drugs should be considered. Several guidelines on this subject have been published.1 There is no general agreement that all of the procedures recommended in the guidelines are necessary or appropriate. 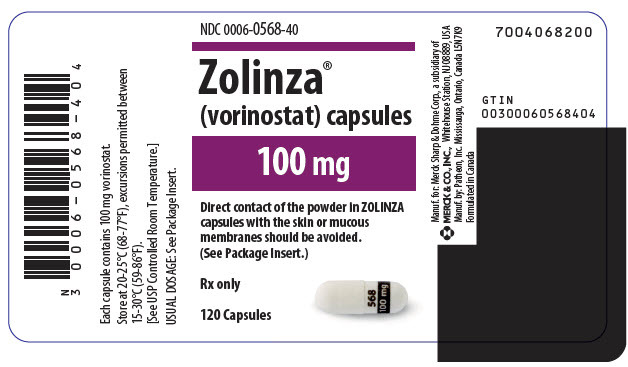 ZOLINZA (vorinostat) capsules should not be opened or crushed. Direct contact of the powder in ZOLINZA capsules with the skin or mucous membranes should be avoided. If such contact occurs, wash thoroughly as outlined in the references. Personnel should avoid exposure to crushed and/or broken capsules [see Nonclinical Toxicology (13.1)]. Patients should be instructed to drink at least 2 L/day of fluid to prevent dehydration and should promptly report excessive vomiting or diarrhea to their physician. Patients should be instructed about the signs of deep vein thrombosis and should consult their physician should any evidence of deep vein thrombosis develop. Patients receiving ZOLINZA should seek immediate medical attention if unusual bleeding occurs. ZOLINZA capsules should not be opened or crushed. Advise patients that ZOLINZA can cause fetal harm when administered during pregnancy [see Warnings and Precautions (5.7) and Use in Specific Populations (8.1)]. Advise females of reproductive potential to use effective contraception during treatment with ZOLINZA and for at least 6 months after the last dose. Advise males with female partners of reproductive potential to use effective contraception and to avoid fathering a child during treatment with ZOLINZA and for at least 3 months after the last dose [see Use in Specific Populations (8.3)]. Advise lactating women not to breastfeed during treatment with ZOLINZA and for at least 1 week after the last dose [see Use in Specific Populations (8.2)]. Copyright © 2006-2018 Merck Sharp & Dohme Corp., a subsidiary of Merck & Co., Inc.
ZOLINZA is a prescription medicine for a type of cancer called cutaneous T-cell lymphoma (CTCL), which is a blood cell cancer that affects your skin. ZOLINZA is used when your CTCL gets worse, does not go away, or comes back after you have taken other medicines. Before you take this medicine, be sure you understand what it is used for and how to take it safely. If you have questions about this medicine, ask your doctor or pharmacist. Every time you get a refill, look at the Patient Information. There may be new information. It is not known if ZOLINZA is safe and effective in children. ZOLINZA has not been studied in pregnant women. It can hurt your baby while you are pregnant. Women of childbearing potential (women who can become pregnant and bear children) should use contraception while taking ZOLINZA and for up to 6 months after the last dose. Please speak with your doctor. Men who have female partners who can become pregnant and bear children, should use contraception while taking ZOLINZA and for up to 3 months after taking the last dose. Please speak with your doctor. We do not know if ZOLINZA can pass into breast milk. Women should not breastfeed while using ZOLINZA and for up to 1 week after the last dose. Please speak with your doctor. If you are taking ZOLINZA and have high blood sugar (hyperglycemia) or diabetes, your doctor may need to change your diet or diabetes medicine to help control your blood sugar. Check your blood sugar as often as your doctor tells you to. If your blood sugar is higher than normal, call your doctor. If you cannot eat or drink like you usually do because you feel sick, vomit, or have diarrhea, call your doctor. Are you taking other medicines? Tell your doctor about all of the medicines you take, including prescription and over-the-counter medicines, vitamins and herbal supplements. Other medicines can affect the way ZOLINZA works. How do I take ZOLINZA? Take ZOLINZA exactly as prescribed by your doctor. Your doctor will tell you how many capsules to take, and when to take them. Drink 8 glasses of water every day (at least 8 ounces each). This will help to keep you hydrated, especially if you have nausea, vomiting or diarrhea. Do not chew or break open the capsule. If you break open or crush a capsule, do not touch the capsule or powder. If the powder gets on your skin or in your eyes, wash your skin or eyes with lots of water right away. Then, call your doctor. If you cannot swallow the capsule, tell your doctor. You may need a different medicine. What if I forget to take ZOLINZA? If you miss a dose, take it as soon as you remember. If you do not remember until it is almost time for your next dose, just skip the missed dose and take the next dose at your regular time. Do not take two doses of ZOLINZA at the same time. If you are not sure what to do, call your doctor. If you take more than your prescribed dose, call your doctor, poison center, or emergency room right away. If you have any of the following signs or symptoms, tell your doctor right away. If you have any side effect that bothers you or does not go away, tell your doctor. There may be other side effects to ZOLINZA that are not listed. For information, ask your doctor or pharmacist. Call your doctor for medical advice about side effects. You may report side effects to FDA at 1-800-FDA-1088. Where should I keep ZOLINZA? Do not let your medicine get really cold or really hot. Keep it at room temperature. Keep ZOLINZA and all medicines out of the reach of children. Medicines are sometimes prescribed for purposes other than those listed in the patient information. Do not use ZOLINZA for a condition for which it was not prescribed. Do not give ZOLINZA to other people, even if they have the same condition. It may harm them. This Patient Information summarizes the most important information about ZOLINZA. If you would like more information, talk with your doctor or pharmacist. You can ask them for information about ZOLINZA that was written for healthcare professionals. For more information, call Merck, the company that makes ZOLINZA, at 1-800-622-4477. What are the ingredients in ZOLINZA? The inactive ingredients are: microcrystalline cellulose, sodium croscarmellose, magnesium stearate, titanium dioxide, gelatin, and sodium lauryl sulfate.